When it comes to improving facilities with high performance, reliable solar power systems, the hyperspace button has arrived. 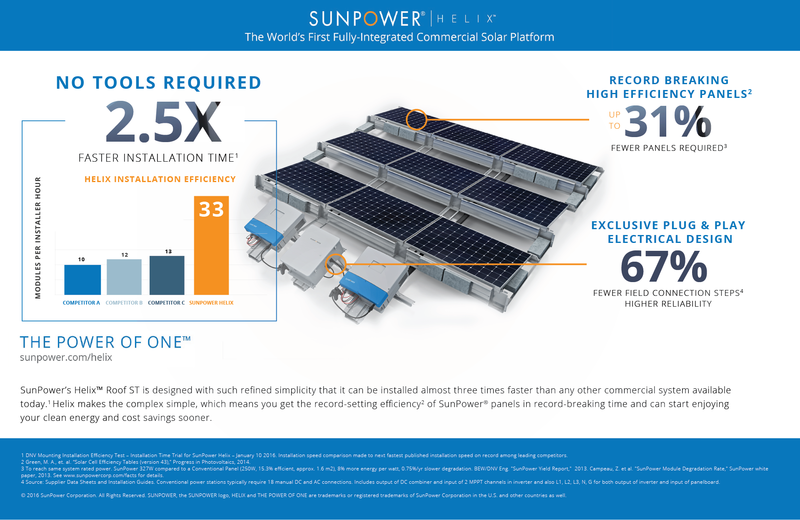 Today, SunPower announced that our SunPower® Helix™ Roof product can be installed 2.5 times faster than other leading commercial rooftop solar power systems. Specifically, while competing products can be installed at a maximum speed of 12 to 13 solar panels per installer hour, Helix systems were installed at 33 panels per installer hour, as certified by DNV GL, a global independent energy expert and certification company. In other words, you can get the world record efficiency1 of SunPower® solar panels at record-breaking installation speed. That means more clean solar power generated on your roof with dramatically less disruption to your business, putting your business on the fast track to saving money and meeting sustainability goals. Most commercial rooftop systems in use today are comprised of components from a variety of manufacturers. Solar system installers incorporate panels, mounting systems and inverters from a wide variety of vendors and then install and wire the system. It’s a complex, costly approach that is time-consuming and labor-intensive with increased risk. At SunPower, we make all of our own components so they work perfectly together. Our design and manufacturing processes are informed by more than 30 years of experience in the solar industry and we’ve deployed more than 7 gigawatts of SunPower solar power systems worldwide. In developing the Helix platform, the world’s first fully integrated solar solution for commercial customers, we’ve applied our decades of experience to make the complex simple. The Helix panels and mounting systems are specifically designed and manufactured by SunPower to work together reliably over the long term. We’ve removed unnecessary parts and streamlined the parts the matter. We’ve engineered every detail to enhance reliability and power generation and to accelerate construction time. For example, the Helix plug-and-play power station — the only one available in the U.S. commercial solar market — eliminates the need to strip and land wires on site. As a result, the Helix Roof system requires 67 percent fewer field connections compared to conventional commercial rooftop systems. And because SunPower solar panels are more efficient, you’ll need 31 percent fewer panels installed. Our customers, whether a CFO or a facility manager, already have tough enough, complex jobs. Getting solar should be simple. With the Helix system, there’s now a 21st century solar power solution for managing long-term energy costs across facilities with minimal business disruption. No more systems made of disparate parts or construction delays that often result from that outmoded approach. No more teams of electricians on the roof stripping wires in the hot sun. No more questions about reliability or long-term system performance. With SunPower Helix systems, we’re streamlining the path to clean energy with another industry first. Interested in learning more about our Helix products? Contact us using this form. © 2016 SunPower Corporation. All Rights Reserved. SUNPOWER, the SUNPOWER logo and HELIX are trademarks or registered trademarks of SunPower Corporation in the U.S. and other countries as well.